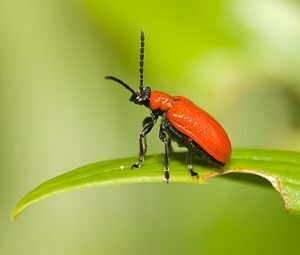 The voracious red lily beetle, also known as lily leaf beetle, is on the move and its range is quickly expanding. Since it was discovered in North America near Montreal in 1945, this destructive pest has slowly invaded much of eastern Canada, and now has moved south into the United States. It was first identified in 1992 in Massachusetts and has rapidly spread throughout New England, moving as far west as Rochester, New York. All true lilies (Lilium) species, including turk’s cap lilies, tiger lilies, Easter lilies, Asiatic and Oriental lilies), and spring-flowering fritillaries (Fritillariasp.) are at risk. Other plants that may suffer damage are Lily-of-the-Valley and Solomon’s Seal.Daylilies are not damaged. Eating of leaves, leading to defoliation, is the major form of damage you will see. This is inflicted to some degree by adults, but mainly by the lily leaf beetle larval stage, which feeds during late spring and early summer. Buds and flowers may also be eaten. The half-inch long adult beetles (Lilioceris lilii) are bright, shiny red on the upper surface and black beneath. Oddly, they are able to produce chirps when disturbed. They live over winter in the soil at the base of lily plants; emerging in spring (generally in late March to early April) to do some minor feeding on leaves and to lay eggs. The eggs are tiny, hard, orange, and laid in uneven rows on the leaf undersides. Red lily beetles will only lay eggs and develop on lily species and species of Fritillaria. Hatch of eggs begins after five days. The young larvae are small, orange and grub-like and cause the majority of feeding damage. The larvae are hard to spot because they quickly cover themselves with blobs of their own excrement (yuk!) and look like particles of dirt. Feeding continues for 16 to 24 days, after which the larvae fall to the ground and form cocoons from which new adult beetles eventually emerge. There can be one to three generations per year. Handpicking adults and larvae and crushing eggs as soon as they are evident in the most environmentally sound method of control. Garden insecticides labeled for general leaf beetle control may also be used according to container directions. Many lily growers report success with neem products, which can be used to kill young larvae, but must be applied to the underside of the leaves every 5 to 7 days after the eggs hatch.